With World War II out of the way, Hollywood moved, but not with the expected results. By 1952 the movie viewing audience was in decline. With 14 million television sets, Americans had become glued to their couches. But, on November 26, 1952, with the searchlights scanning the skies of Los Angeles, Hollywood hoped it had found the answer to fill the theaters once again. The fanfare was for the opening of Bwana Devil, a movie featuring the new technique called "Natural Vision", or as it later became known, 3-D. The movie opened to capacity crowds and by the end of the first week had grossed $95,000 in ticket sales. In the standards of today, that does not sound as if the movie was a success, but in 1952 it set records. (Remember that a ticket in 1952 was 50 cents). Bwana Devil was set in Africa, produced by United Artists and starred Robert Stack and Barbara Britton. The movie was in thrilling color. 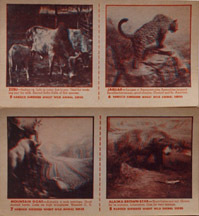 The posters featured a "lion in your lap and a woman in your arms." The poster showed a lion leaping out into the movie audience. The movie was produced by Arch Oboler, who was famous for his radio show of horror and fear, Lights Out. The movie was panned by the critics, but loved by audiences. Hollywood was always hunting for a new gimmick and 3-D was just what producers were looking for. Actually, the 3-D process was not new and in fact had been around since the turn of the century in various forms. Even 3-D movies had been produced in the past, but had not caught on with audiences. 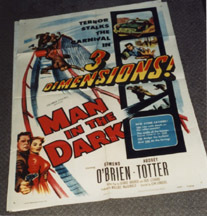 1950's 3-D Man in the Dark BBwana Devil had been filmed in Ansocolor and printed on DuPont color print film. The movie took on a high contrast and the colors were vibrant. Robert Stack seemed to be always pointing his rifle into the audience. Movie-goers enjoyed the novelty of wearing cardboard glasses, seeing actors and actresses appear close enough to touch and feeling like they were part of the action. As is the case with Hollywood, the first success convinced the studios to turn out more and more movies in 3-D.
One of the more memorable movies was the 1953 It Came From Outer Space based on a science fiction story by the famous Ray Bradbury. The movie fit into the UFO craze of the time - and the fact that aliens were being seen everywhere. Audiences were frightened by the aliens with their dark, glowing eyes. In 3-D, the aliens appeared to move among the audience in the dark theater. The year 1953 was the peak of 3-D movies. Charge at Feather River had arrows that came flying from the screen into the audience, or so it seemed. The horror film The House of Wax, starring Vincent Price, featured a dead body being hoisted out a window - falling and appearing to land in the first row. The House of Wax has another memorable scene - a barker outside of the museum hitting string paddle balls, which appear to fly out from the screen. After the novelty wore off, so did the gimmick of sitting in the dark wearing paper glasses. The 3-D movies were killed by poor quality scripts, television and the fact that theaters had to put in new expensive projectors to project the product. 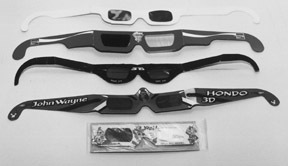 In the 1950s, movies were not the only area of collectible material connected to 3-D. Comic books were issued in 3-D viewing versions, including Bat-Man, Mighty Mouse, Shenna, Queen of the Jungle, the Three Stooges, love comics and horror comics. For a brief span of a few years, this was the rage in printed matter. The difficulty was that kids usually quickly lost the special red-blue glasses. Without the viewing glasses, the comic book became very difficult to read. 3-D also moved into the world of cereal and gum cards. The Topps card and gum company of New York City put out several 3-D sets in 1953. A tiny viewer was included in each pack of gum with the cards. There was an educational set called "Look N See." This set included such cards as: Aviator, Charles Lindbergh, Patriot, Nathan Hale and card #1, Franklin D. Roosevelt. There was a question on the back and one had to place the piece of colored cellophane that came in the pack over it to reveal the answer in 3-D.
Topps issued two Tarzan sets: "Tarzan and the She Devil" and "Tarzan's Savage Fury." Both were issued in gum packs in 1953 and contained 60 different cards to make up a complete set. Roy Rogers and circus cards appeared in cereals in the 1950s. The cards served a dual purpose: an inducement for kids to get their parents to buy cereal and the use of the card as a separator in the box of the two layers of cereal. Other collectibles connected to the 3-D craze are the large movie stand-ups that were supplied to the theaters to advertise the movie. These pop-ups were usually made of cardboard or heavy paper. The artwork was cut out in such a manner to give a feeling of depth to the object displayed. For the display for The House of Wax, it appears that the killer is jumping right from the display with a victim. There were posters, comics, gum and cereal cards, magazines, viewers, projectors, slides and other items that are discovered on a regular basis. Flea markets, yard sales and second-hand stores are the best places to find 3-D collectibles. Collectible 3-D material is plentiful and the majority of material is very affordable. Much of the material is paper in nature. Therefore look for condition, as this is the most important aspect of collecting 3-D material. Paper in good condition will last, but if the material is already in poor condition, it will continue to deteriorate. Make sure the 3-D glasses have both lenses. Also, if purchasing an item such as a comic book, check to see if the glasses are still inside. A 3-D item loses much of its value without the glasses. Since the glasses had to be removed from the comic to use, the glasses were often lost very quickly. Six major cartoons were produced in a 3-D version during this period. Boo Moon was Casper the Friendly Ghost, Lumber Jack Rabbit - Bugs Bunny, Working for Peanuts - Donald Duck, Hypnotic Kick - Woody Woodpecker, Ace of Pace - Popeye, and Melody by the Disney Studio. The Internet is full of sites connected to movie poster collecting, comic books, picture cards and other material. Just go to one of the search engines and type in 3-D material or collectibles.